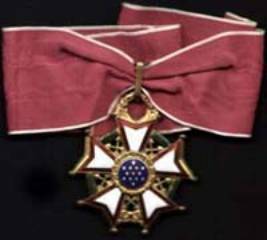 The Legion of Merit was the first US decoration created specifically as an award for citizens of other nations, and it is the first awarded to have different degrees to conform with other nations. Officer of the Legion of Merit [above] - awarded to foreign generals or admirals, high ranking civil authorities and foreign attaches. Chief Commander of the Legion of Merit - awarded to chiefs of state or heads of government. Commander of the Legion of Merit [above]- awarded to foreign recipients who are equivalent to a chief of staff in the United States, or to a leader lower than a head of state. This decoration was authorized in July 1942 and amended in March 1955. Legion of Merit, Legionnaire [left] - awarded to all other eligible personnel.